The Mount Vesuvius rank among the most explored and well known volcanoes on earth. Nowadays it is a very popular tourist attraction, even though know one knows when it will again awake from its sleep. On clear days you can see the silhouette of the gigantic mountains of the volcano from the whole Bay of Naples. The volcano, “the hunchback” (in Napoli language: scartellato) is seen as a friendly companion by the people of Naples (Napoli) in spite of its destructive potentials. It has been sleeping since 1944 under the watchful eyes of volcanologists, who regularly measure its temperature. 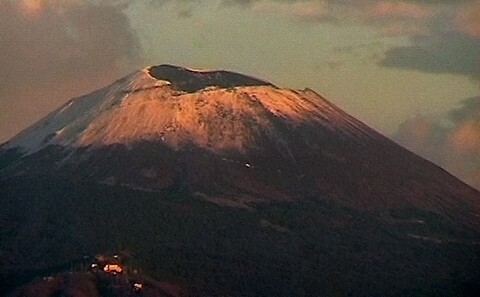 In reality the volcano system, in general called the Vesuvius, comprises two volcanoes: The Monte Somma (dormant) and the Vesuvius (Gran Cono). The incredible crater (Gran Cono) of the Vesuvius of nowadays has a diameter of 700 m, a circumference of 12 km and is 200 m deep. The original volcano was probably destroyed by its eruption 79 A.D. when the streams of lava buried Pompeii and Herculaneum. At that time the volcano claimed thousands of lives and turned the idyllic, overgrown slopes into sand and ashes within only a few hours. Today’s Vesuv with its 1182m arose from this eruption. The Monte Somma (1132m) in the north is probably a gigantic remnant of a volcano that developed in prehistoric times 25 000 years ago. In 1631 all the settlements closeby the Vesuvius were destroyed. This is even more shocking when you call to mind that the settlements at the foot of the Vesuvius are today again densely populated. It erupted again in 1794, 1906 and 1913. Between 1933 and 1944 the volcano activity eventually reached a new climax. Accompanied by numerous earthquakes the vulcano buried several houses and towns underneath more than 250 million cubic metres of lava. Even the cable car, that became so well known through the folk song “Funiculi, funicula”, at the slopes of the Vesuvius, fell victim to the lava then. New volcano eruptions can be predicted by volcanologists two weeks in advance. You can have a look at the single summitted Mount Vesuvius in the National Archaeological Museum in Naples. By car: From Naples with the A3, take the Torre del Greco or Ercolano exit. 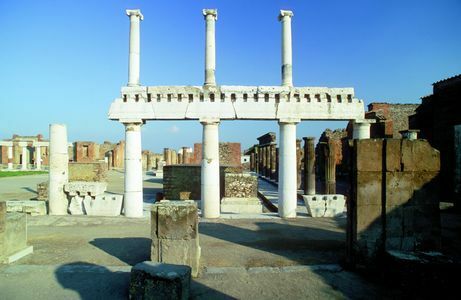 By Circumvesuviana (train) : Get off in Ercolano (Herculaneum) and drive by bus to the car park. A road leads you up through beautiful vineyards, lava fields and the valleys Valle del Gigante and Valle dell’Inferno. One can smell the typical smell of broom bushes between may and august. On foot the ascent leads you from the 1000m high parking spot with its Souvenir and refreshment stands over a gravel road to the top. When the weather is fine visitors can enjoy a fantastic panoramic view. The ascent to the edge of the crater costs ca. 10 Euro (reduced 8 euro). The parking is 6 euro for cars and 3 euro for motor bikes. Closing times between 15 and 18 hours depending on the season. It is recommendable to visit the Vesuvius on working days, as locals like to visit it on weekends and this can lead to traffic jams. All data without guarantee. Timetable, rates, bus and metro line subject to modification.